Your home’s crawlspace is designed for convenience. It is used to hide plumbing, wiring, and other utilities to free up valuable space inside your home. Plumbing, however, is prone to leaking. If a pipe were to burst inside the crawlspace, the moisture accumulation would slowly enter your home from below. Then, mold growth is sure to follow. 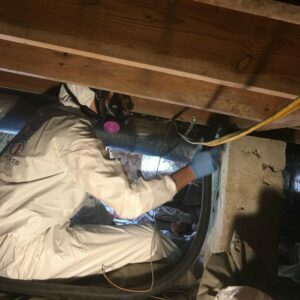 Our professional crawlspace encapsulation services are guaranteed to reduce the risk of moisture, mold, humidity, and pests from below your feet. Reduced Energy Bills – Taking steps to encapsulate your crawlspace can maintain indoor temperatures more efficiently. You can reduce your energy use by nearly 20%. Property Values – Having a closed-off crawlspace adds value to your home. Reduced Repairs – If moisture and mold were to set in, the cost would be extensive. Encapsulation, with proper ventilation and dehumidification, will reduce both and avoid costly repairs. With moisture and humidity, your crawlspace would become a breeding ground for mold. By closing off the crawlspace, you can reduce both moisture and humidity inside and rid yourself of the worry of mold growth. We pair encapsulation with a dehumidification system to stop mold from growing. Besides the obvious reasons, such as mold prevention, you’ll save more money over the years as crawlspace encapsulation increases the energy efficiency of your home. Furthermore, if the time ever comes to sell your home, encapsulation means you can leverage more money for the property. We mentioned reduced energy bills, increased property values, and reduced repairs. However, crawlspace encapsulation can also provide peace of mind – one of the biggest advantages. No longer must you worry about mold creeping through the floorboards or water-borne pests that love the moisture invading your home. Schedule professional crawlspace encapsulation with Restoration 1 to enjoy numerous benefits. Find a Restoration 1 near you with our location guide!